£1,000 Excess Cover: In the unlikely event that a break in occurs through failure of the hardware, MACO will refund your home contents insurance excess up to £1,000. 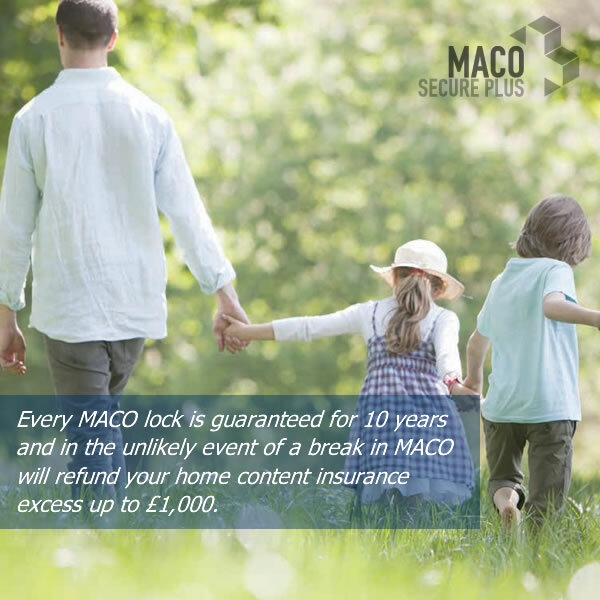 10 Year Guarantee: Every MACO product is guaranteed for 10 years with the unique MACO Secure Plus repair or replace policy. 24hr Emergency Lock Breakdown: You’ll be covered by a 24 hour Emergency Lock Breakdown Service normally with you within 2-4 hours. So you can sleep easy knowing we’ll be there, to make your home secure any time of the day or night come rain or shine. Secure Key Holder Service: As a MACO customer you can have access to an optional Secure Key Holding Service. Should you forget or lose your keys then entry into your property can be almost impossible. Rather than engaging an expensive and often damaging locksmith, we can let you back in again, any time of the day or night. Alarm Response Service In addition you can register for our Alarm Response Service that can quickly respond and rectify any problems encountered at your property whilst you are away from home or on holiday. Lost Key Return Service In the event that your lost keys are found and returned, the finder receives a £10 reward paid by us.